In the great room, the decorative concrete floor, embellished with gemstones and fossilized shells, leads out to a veranda overlooking the mountain valley. The cast-in-place concrete fireplace hearth extends the entire length of the wall, helping to anchor the space. The kitchen uses a mixture of natural, eco-friendly materials. The precast concrete island and countertops were made with CHENG Pro-Formula Mix and embedded with stone inlays. 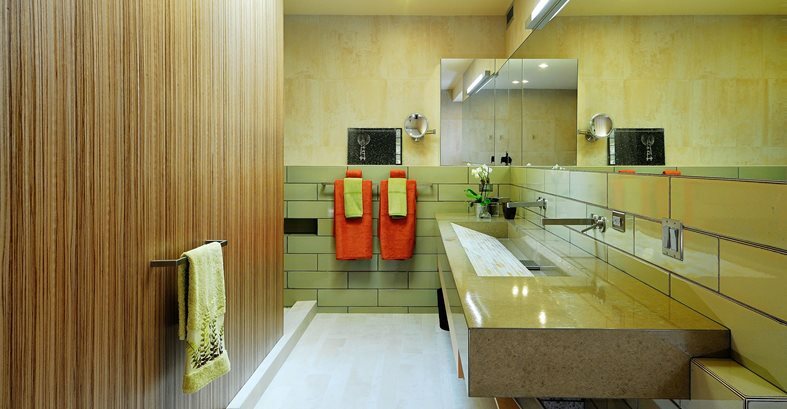 The flooring is eco-friendly formaldehyde-free bamboo, and the cabinets are made with composite wood veneers. 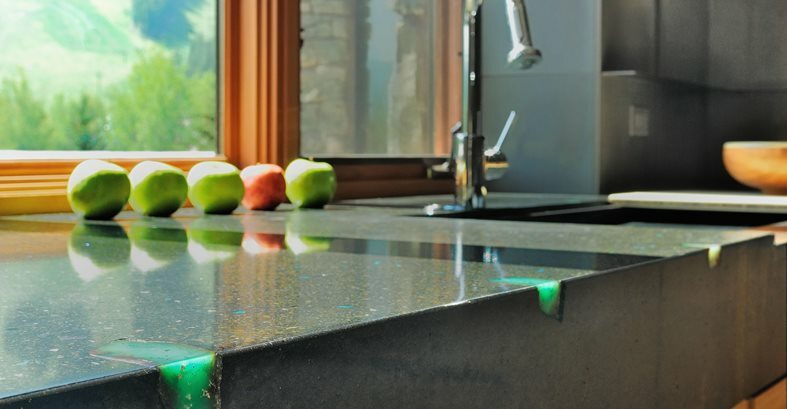 Australian jadeite gemstones cast into the kitchen countertop are placed so the morning sun enhances their luminosity. 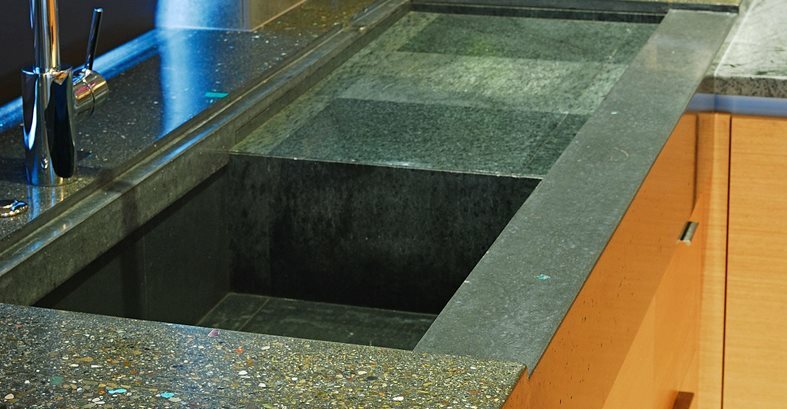 The polished concrete countertop is also scattered with pieces of turquoise. Cast into the kitchen countertop is an integral concrete sink with a soapstone drainboard. 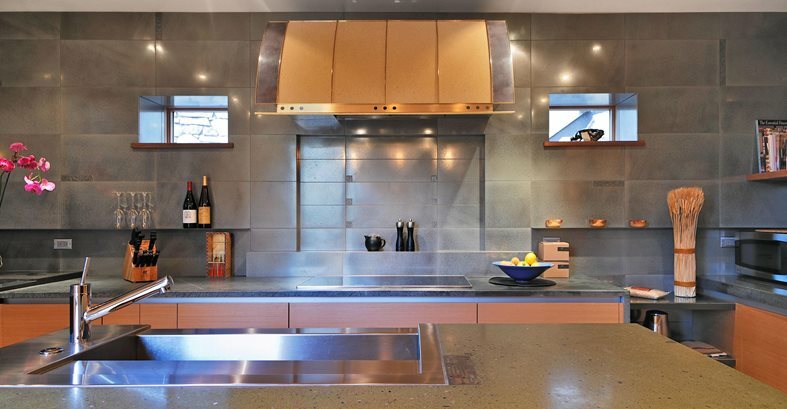 A custom stainless steel prep sink wraps over the corner of the precast concrete island top. Both bedrooms have precast concrete fireplace surrounds made with CHENG NeoMix, a proprietary formula with micro-reinforcement fibers. 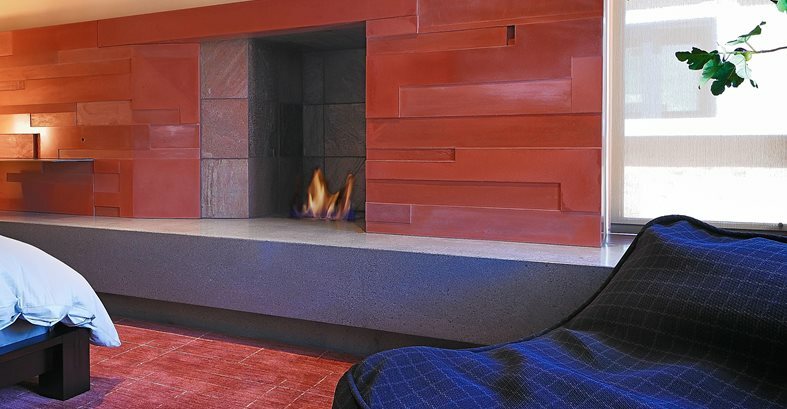 The hearth is site-cast concrete with a smooth, polished finish. The fireboxes (from EcoSmart Fire) use clean burning, ethanol fuel. 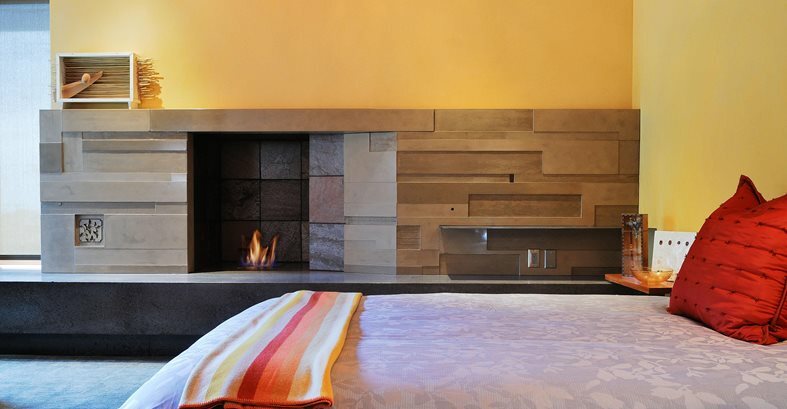 The concrete fireplace in the second bedroom is similar in design but uses a different color palette. The master bath has a precast concrete sink (made with CHENG Pro-Formula) and a backsplash lined with glass mosaic tile. 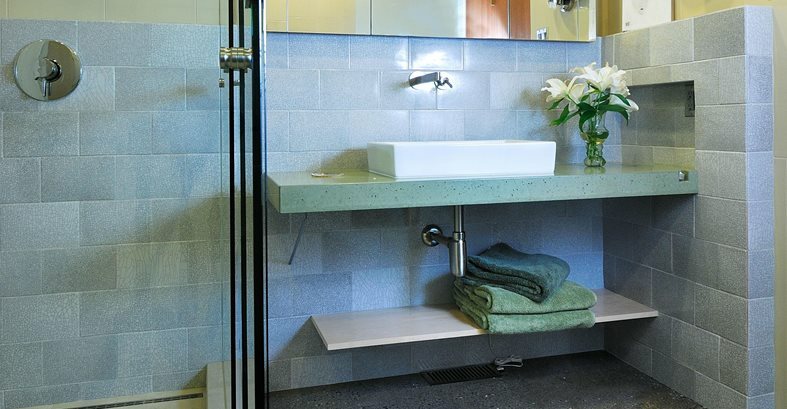 The pale green concrete vanity in the guest bathroom is topped with a porcelain sink that echoes the rectangular shape. A close-up of the polished decorative concrete floor in the great room, showing the copper dividing strips and ammonite fossil inlays. The floor is also radiant heated. 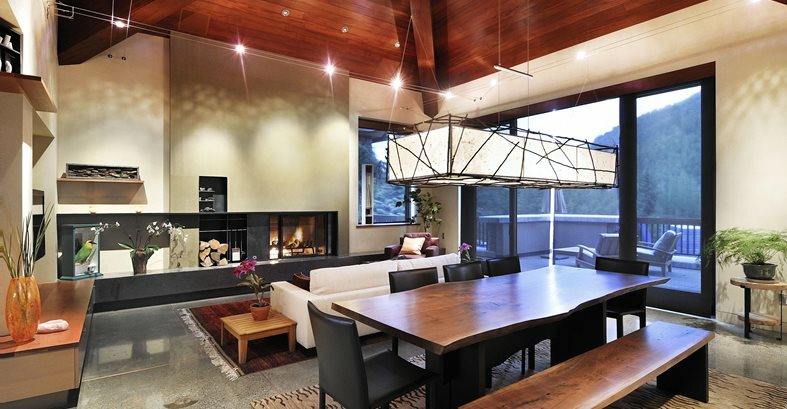 Eschewing the stereotype of the typical ski chalet, with its log walls, dark interior and rustic décor, this new townhouse in Idaho's Sun Valley, a popular skiing mecca and arts community, puts a modern twist on the Alpine look by incorporating decorative concrete in almost every room. "The exterior of the townhouse is a stone-clad structure appropriate for the region. Our challenge was to create a more modern interior while integrating it with the character of the building architecture," says Fu-Tung Cheng of Cheng Design, who was chosen by the builder to design and build out the interior of the home. The townhouse is nestled into a mountainside, with beautiful views of Sun Valley and its ski slopes. However, the site limited where windows could be located. Most of the windows are in front of the townhouse, so some rooms receive no natural daylight. Because of this, it was important to use interior finishes that would add warmth and light while reinforcing a sense of structural gravity against the backdrop of the mountainside. "Having seen our concrete work firsthand, both in our Berkeley, Calif., showroom and at Teance, a local tea house full of our concrete designs and installations, the client was convinced that there would be no substituting the sculptural appeal of concrete the way we use it," says Cheng. Cheng was given carte blanche to design the interior of all the rooms in the three-story townhouse, including the entry hall, great room, kitchen, two master bedroom suites, and guest bathroom. Asked to balance the modern with a more traditional sensibility, Cheng used warm, earthy materials in a mix of smooth and textured finishes with clean, modern detailing. The project included both site-cast and shop-cast concrete elements, including a poured-in-place decorative concrete floor on the main level of the home, precast concrete fireplace surrounds, a polished concrete countertop with an integral sink, a kitchen island, and two bathroom vanities. The color scheme for the interior is predominantly earth-toned, blending neutral beiges with richer brown, charcoal, and green tones. The client selected the hues from the CHENG Pro-Formula Mix color palette. "It is convenient for our client to choose from formulas that are accurate and proprietary at the same time," says Cheng. A mixture of concrete finishes was also used to provide a balance of smooth and textured surfaces. "We altered from ground and polished exposed aggregates to our signature unpolished but mirror-finished Geocrete look," says Cheng. Much of the decorative concrete throughout the home features custom accents such as inlaid gemstones, fossils and mosaic tiles to add an extra level of detail often missing in modernist design. 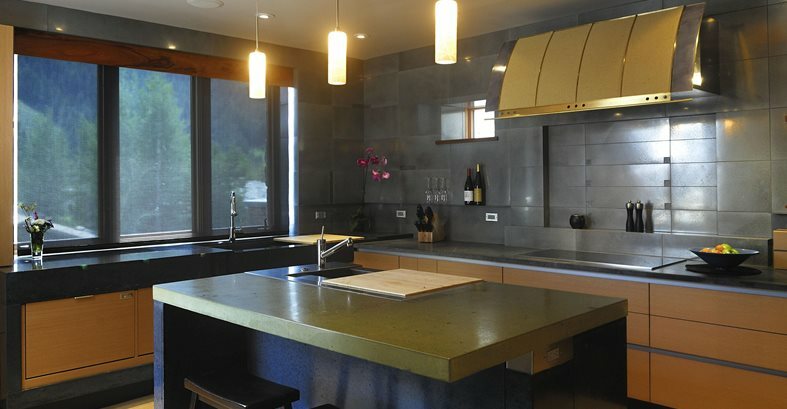 The charcoal-gray precast concrete countertops in the kitchen are embedded with turquoise and Australian jadeite, an apple-green colored gemstone. 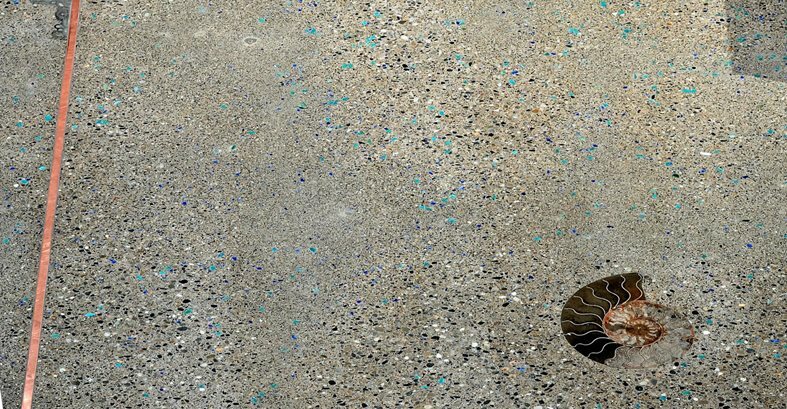 The main level of the townhouse features beautifully polished decorative concrete floors embellished with inlaid ammonite (a spiral-shaped fossilized shell), semi-precious stones and copper accent strips. Both bedrooms have fireplace surrounds of integrally colored glass-fiber-reinforced concrete, with fireboxes that use clean-burning ethanol fuel. The surrounds were precast using CHENG NeoMix decorative fiber-reinforced concrete, which Cheng says is easier to use than GFRC because it requires no blending and can be applied more thinly. The fireplace hearths in the bedrooms and great room were site cast using Cheng's proprietary technique for achieving super-smooth and glossy concrete surfaces. In the great room, the dark-gray concrete hearth beautifully complements a custom fireplace surround of 3/8-inch plate steel. All of this attention to detail and finish treatments creates an interior aesthetic that reflects the magnificence of the mountain surroundings. "The project certainly met my goal for a sophisticated interior of a rustic, ski country chalet, without resorting to the usual clichés of peeled logs and deer antler chandeliers," says Cheng. "Needless to say, the client was thrilled with the results." Builder/developer: Edgar Fenwick, Ketchum, Ida.